I love tarts! It really is as simple as that! So when presented with baking something for the lovely Lala’s 30tea party I decided on the perfect pair! These sweet egg custard delights encased in crisp flakey pastry are in my top five of guilty pleasures! Having been to Portugal where I completely over indulged in their national tart – I think I averaged four per day, I still can’t get enough. If you do happen to be in Lisbon you must pay a visit to the home of the Portuguese Tart – Casa Pasteis De Belem, believed to be created before the 18th century by Catholic nuns in a monastery in Belem in Lisbon, this bakery was the first place outside the convent selling the original creamy dessert, after the monastery was closed in the 1820s. There most definitely will be a long line awaiting you but let me assure you the wait is worth it. And don’t go soft on me, ordering less than six of these gifts from the gods is unacceptable! 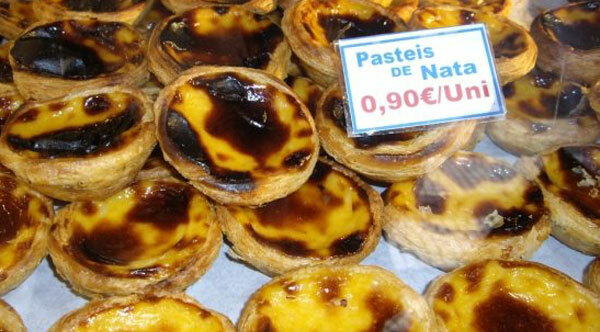 I have found a Portuguese bakery in London which quite often cures my custard cravings. Lisboa Patisserie (4 Plender Street, London, NW1 0JP) has an impressive selection of pastries to make any mouth water and thier egg tarts are totally moorish. But in my quest to be able to create all of the food I love, I decided it was time to make like the nuns and create this little gift from God! 1. Lightly grease a 12-hole muffin tin. 3. Place the pan over a medium heat and cook, stirring, until the mixture thickens and comes to the boil. Remove from the heat and stir in the vanilla extract. Transfer the custard to a bowl, cover the surface with cling film to prevent a skin forming and leave to cool. 4. Preheat the oven to 190C/gas 5. 6. Press the pastry rounds into the muffin tin. Spoon the cooled custard into the pastry cases and bake for 20-25 minutes, or until the pastry and custard are golden. Leave the tarts in the tin for 5 minutes, then transfer to a wire rack to cool completely. 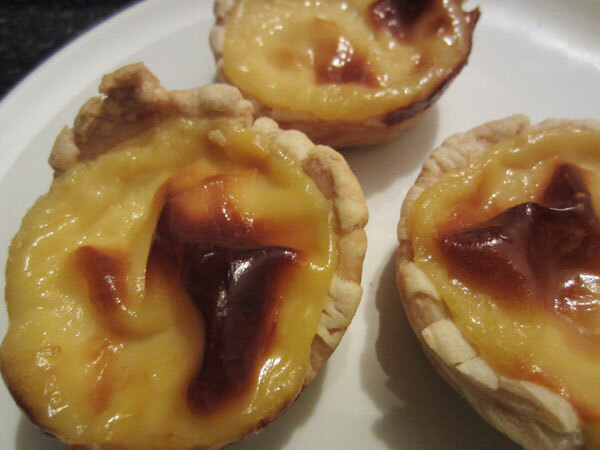 I wasn’t completely satisfied with the pastry on my tarts, not crunchy or as delicate as it should be. However the custard filling was pretty spot on! I will work on perfecting my pastry! My passion for rhubarb is clearly evident and this tart is one of my finest rhubarb creations! It is a rhubarb twist on the classic lemon meringue tart – which is also a favourite! The rhubarb is deliciously tart against the sweetness of the meringue and the pastry is quite dense and soaks up the juices of the fruit. I am not at all confidant at making pastry – to be honest it scares me a little but I was surprised at how easy it was to make this sweet pastry and how delicious it was. So I encourage all pastry-phobes to give it a go or if you can’t spare the time just use some ready made shortcrust pastry. Put the flour, sugar and salt in a bowl, cut the butter into pieces and work it into the flour with your fingertips. Make a well in the middle and add the egg, egg yolk and vanilla. Stir with a fork to incorporate the flour evenly untik you have to begin using your hand. Using just one hand, bring the dry and wet ingerdients together. Dust your work surface with flour and knead the doughfor a few minutes until it is smooth. Now roll out the dough to a thickness of about 5mm. Carefully lift it up with the rolling pin and ease it into the tart case. Don’t worry if it breaks just patch it up with extra dough. Now chill the tart case for at least 30min before baking. Bake blind in a preheated oven at 180C for about 20min until the pastry is just turning golden. Place the rhubarb in a baking dish with the sugar and orange zest and cover with foil. Back for about 30min until the rhubarb is soft and a good syrup has formed. 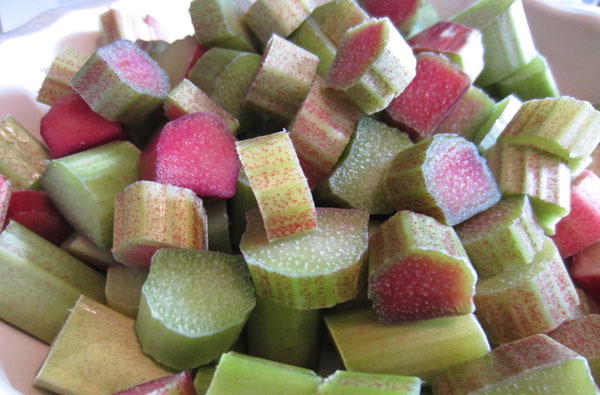 Remove from the oven and mix, mashing the rhubarb slightly. Set aside to cool. Keep the oven switched on. To make the meringue, beat the egg whites till they form soft peaks, then slowly add the sugar. Beat constantly till the meringue is think and glossy. Add the vanilla, vinegar and cream of tartar and fold in well. 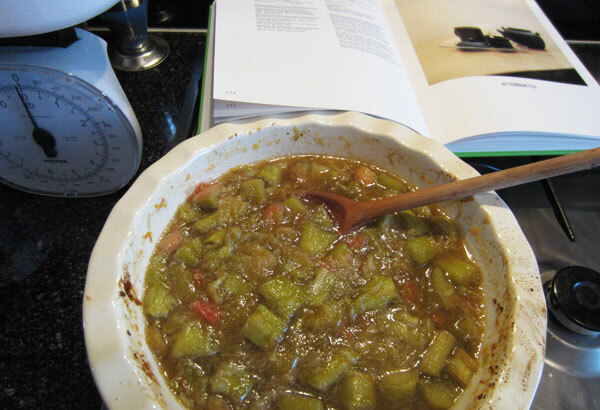 Spoon the rhubarb into the tart case and pipe or spoon the meringe on top. Bake for about 20-25 min until the meringue starts to turn brown and is slightly crisp. 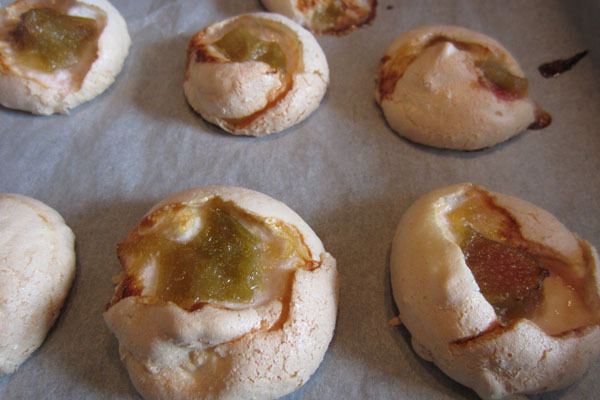 I had some left over meringue so I made these little rhubarb kisses! 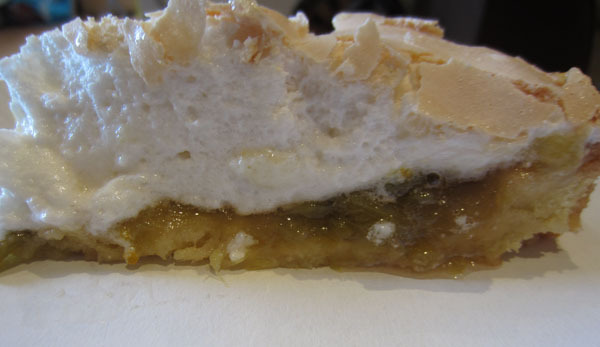 Just spoon dallops of meringue onto small baking paper then place a small piece of baked rhubarb into the centre. 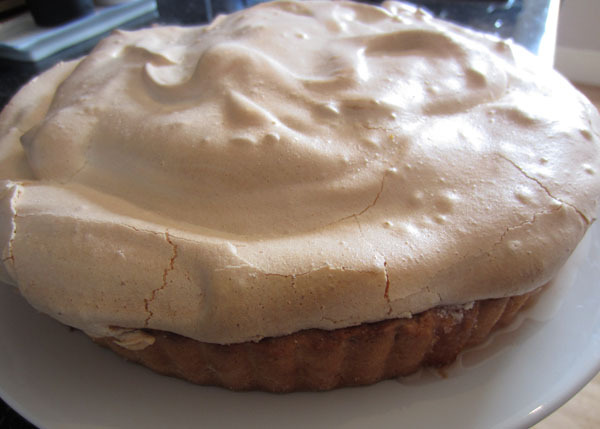 Bake into the meringue is crisp. They are really quite delightful and look very pretty!